Polish angler Irek and his group of fishing friends began their Thailand fishing holiday with a visit to Palm Tree Lagoon. Fishing with both carp and catfish and also predator outfits the anglers began fishing. One of the guys was soon attached to an Alligator Gar which proceeded to leap out of the water on several occasions before finally being landed. Other members of the Polish fishing party were soon into fish with several smaller carp species landed in the earlier part of the morning. Irek soon receieved a take on his predator setup which tore off across the fishing pond at high speed. The unseen fish hugged the bottom tightly as only a Redtail Catfish would and was soon chugging up and down the nearby margin. Continued pressure soon took its toll and the Redtail Catfish was duly landed. 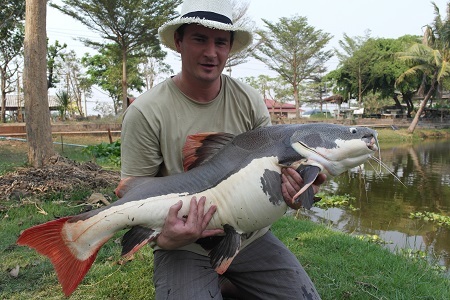 The Redtail Catfish was estimated to weigh 20-25kg’s and was released after capture. Further action was received by all of the anglers with all of the guys catching predators mostly in the form of Redtail Catfish,Sorubim, Alligator Gar and a bonus Tambaqui. With large Arapaima constantly surfacing around the fishing pond the anglers tried casting into their path. Unfortunately the Arapaima were not forthcoming and the anglers failed to land any of the real monsters of Palm Tree Lagoon. After an enjoyable days fishing at Palm Tree Lagoon the anglers were soon on their way to the next fishing venue on their itinerary the awesome Khao Laem Dam in Kanchanaburi in search of Giant Snakeheads.